New Feature PostIt. Now you can edit your annotation on tasks. 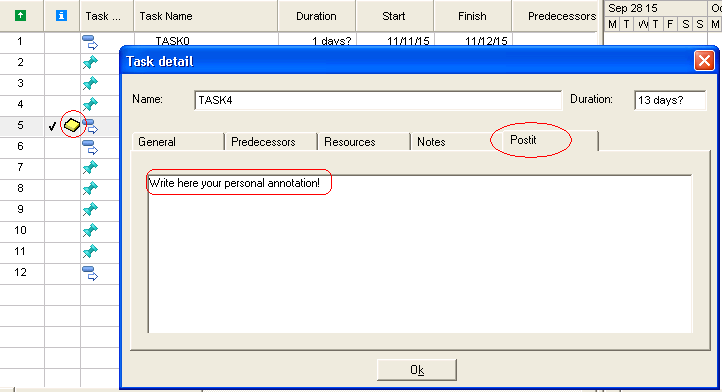 In order to add a Postit you have to open the task detail and choose the Postit section. In order to know if a task has a Postit a special icon is showed on the indicator column. In order to view the Postit on the task table you can add the Postit column. The Postit is saved locally on your PC (find the file postit.ini), if you move the file in another folder the Postit will be not showed. If you are interested in having the possibility to share the Postit with other project users, please contact us. Support to open mpp file stored on Box.com. Support to open mpp file stored on Dropbox. Microsoft Project 2013 compatible for .mpp and .mpt file format. Support to open mpp file stored on Google Drive. Available on the Evaluation and Professional edition now you can access to the MPP data by the Project Reader engine using Visual Basic for Application. Finding project data is now very easy. The find tool allow you to search data, in smart way, depending on the filed type: text, number, date, duration, work and cost. You can compare fields using your custom data or choosing another compatible field of the project. To choose the compatible fileds you have to click on the icon . Depending on the field type many logic operator are available: equals, does not equals, is greater than, is greater than or equal to, is less than, is less than or equal to, is not within, is within, contains, does not contains. More information at licensing page. Microsoft Project 2010 compatible for .mpp and .mpt file format. Support for new scheduling modes: manually schedule or automatic schedule. Support in opening Project 2007 file saved using Microsoft Project 2010. Support in opening Project 2003 file saved using Microsoft Project 2010. BUG FIX: corrected a bug in exporting data. BUG FIX: corrected a bug in showing tasks as subproject. When you export a project into a CSV file you have to choose which information will be exported: Tasks, Resources or Assignments. The field will be separated by the carachter ';'. Printing: Project Reader is able to accept commands to print directly from the command line; using this method it is possible to schedule print queues to execute at any time. For more information and examples see the help file. New option: by selecting the option "Always use the default printer" all projects will be printed on the default printer. 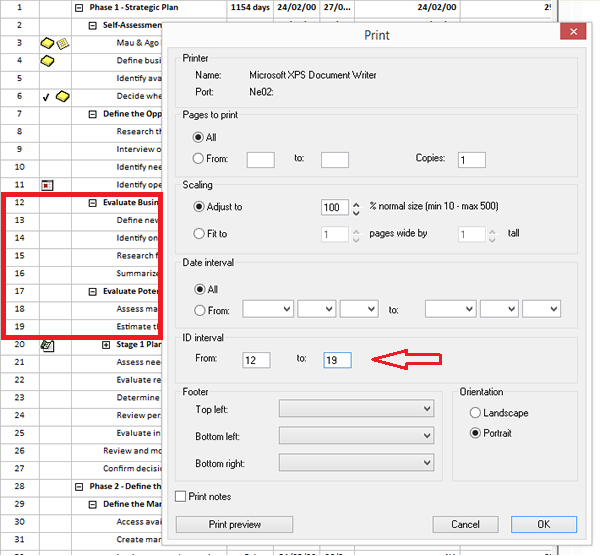 If the option is not selected then printing will take place on the printer last used by Project Reader. BUG FIX: corrected a bug, introduced in previous version 3.4.0 , where some project files were not properly opened. BUG FIX: the project calendar for Microsoft Project 2007 .mpp files is now properly shown. Added the notes column into "insert column list"
Improved the SQL Server connection: now you can use the trusted connection and you can specify optionally the database name (Initial catalog) and the instance of SqlServer, if you have installed more than one SQLServer on the same windows server. Scaling: specifies how to want to adjust the printed image size. You can shrink or expand it by a specified percentage (Adjust to), or specify that it fit on a specific number of pages (Fit to). Click here to view the screenshot. Able to open MPP file containing no latin language (i.e. Arabic, Japanese, Chinese, Korean, Russian, ...) on PC with latin international settings (i.e. with English, French,...). Test performed in China and Hong Kong by our new customer. Click here to see an example. Support to open .MPP files saved using Microsoft Project 98. Sort by column with "Keep outline structure" option. Option View->Links to hide links between tasks in Gantt Chart. Option View->Outline Level. you can show or hide the tasks until your preferred outline level. XML file format. Project Reader is able to open MS Project 2002 2003 .XML file format. Support to Open .MPP file on workstation with Asiatic International Settings. New option. You can choose the decimal digit on duration fields. New assignment detail window. 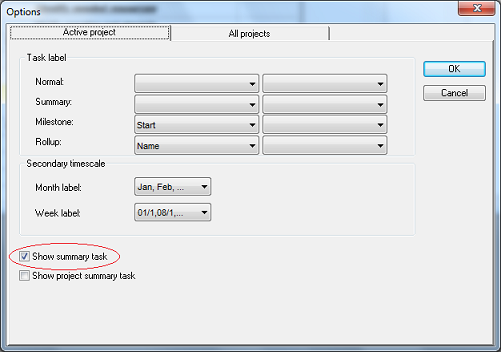 You can view the assignment detail window clicking on assignment in Task Usage View or Resource Usage View. Maintenance update version that encapsulates software bug fixes in MPP project opening. MPP file format. Project Reader is able to open MS Project 2000 2002 2003 .MPP file format. Faster in opening project's plan. MS Project 98 compatible. Project Reader is able to open MS Project 98 database format (*.mpd, *.mdb). MS Project 98 compatible. Project Reader is able to open MS Project 98 database format on SQLServer and Oracle). Resource Usage View. A new funtionality to view all the tasks assigned resource by resource, and all the tasks not assigned. Command line file name parameter. You can open a Project by double clicking on file name. 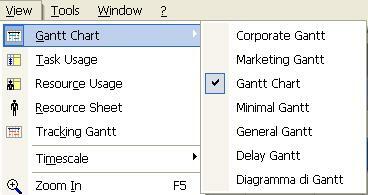 Roll-up Tasks shown on gantt chart. New preference. The Save preferences on exit checkbox allows you to save project's window preferences automatically everytime you close the project. Preferences are composed by: windows location and dimension, current views and current timescale values. If you don't check "Save preferences on exit", to save window's preferences you must require "Save preferences" explicitly (menu File -> Save preferences).